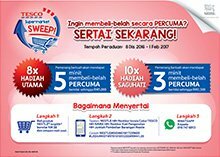 Home » Food n Beverage » lucky » lucky draw » Nestle » purchase » spend » Tesco » WhatsApp » Peraduan TESCO Supermarket Sweep Contest: A chance to "sweep" groceries worth up to a maximum of RM3,888! Peraduan TESCO Supermarket Sweep Contest: A chance to "sweep" groceries worth up to a maximum of RM3,888! Grand Prizes x 8 winners: Each Qualified Participant is entitled to “sweep” groceries worth up to a maximum of RM3,888 only. Consolation Prizes x 10 winners: Each Qualified Participant is entitled to “sweep” groceries worth up to a maximum of RM1,888 only. Purchase a minimum of RM38 of any participating NESTLÉ products EXCEPT all NESTLÉ infant formulas and Dolce Gusto products, in a single printed receipt from any participating TESCO outlets during the Contest Period. The original TESCO single printed receipt must contain the NESTLÉ participating products purchased, the purchase amount, the outlet name, the receipt number and the date of purchase clearly stated on the printed receipt [“POP”]. All Contest entries must be submitted/sent via WhatsApp application from any locally registered mobile number to 016-7476813, a dedicated phone line set-up by the Organiser to receive entries submitted by Participants. Each Contest entry must contain the key code – NESTLE, followed by [#], TESCO receipt number (full 16 digit number featured at the bottom of the TESCO receipt), followed by [#], full name, followed by [#], identification number followed by [#], NESTLÉ products purchase amount [“Required Details”]. The Required Details must be typed in one (1) single line and submitted/sent via WhatsApp to 016-7476813. Visit Peraduan TESCO Supermarket Sweep contest's rules & regulations (in English) or (in Bahasa Malaysia) for more details.